I paid $25 for this little jewel last summer at a garage sale. It was a practically new food processor, complete with the owner's manual and box. The lady who sold it to me said she'd never even opened it! Seriously, Lady, do you cook at all? Anyways, what a steal! Several times a week I look at it and think about how I've probably not found a better use for 25 bucks. 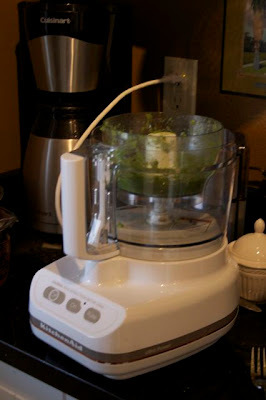 I'm making baby food, hummus, salsa, all sorts of yummy things thanks to my little Kitchen Aid. I used to pass over recipes when I saw they had to be pureed or chopped or food processed of some sort. No more! Come on, 2009 Garage Sale Season!